Brilliant book for developing the emotional fortitude necessary for leadership. A little crotchety for my tastes at times, but some of that may come with the territory. Finished April, 2012. America, Friedman says, is a deeply anxious place without many leaders who have the “nerve” to lead through the anxiety with clarity and resolve. This “failure of nerve” has become who we are at every level – a highly reactive people, without the fortitude to resist the emotional pulls that arise between people in organizations, government, and families. This reality bends us towards self-destruction. America has both conceptual and emotional vulnerabilities that reinforce one another. Friedman sees the conceptual problem rooted in the “social science construction of reality,” which focuses on labels describing identity in a particular social group or personality type, rather than their place in the emotional system in which they are surrounded. The emotional problem is too strong of an attachment to others and how they can be motivated, changed, placated, etc., and not enough attention on how one can change one’s self in the midst of an emotional system and let that system adapt to that change. The first part of the book will focus on describing the denial of emotional systems at work in leader’s contexts that leads to the erosion of individuation in leadership and perverts our very understanding of leadership. The second part of the book describes positive new ways to understand and enact leadership that avoid the “failure of nerve.” The book is intended for anyone who must lead within anxiety-driven, reactive cultures. 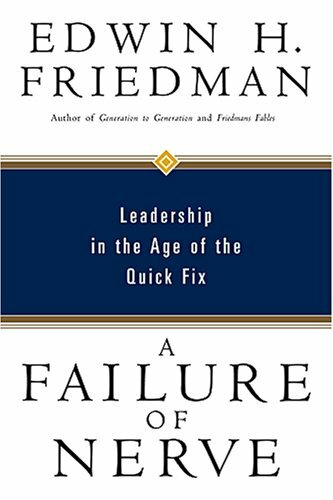 Friedman’s realizations about leadership and the culture’s “failure of nerve” developed slowly throughout a 40 year career with experience in congregations, businesses, and government. Although different types of organizations use different language, the culture of reaction and anxiety and leadership’s failure of nerve seems to be universal. Furthermore, many “solutions” are just problems in remission, usually surfacing again later, because they were never adequately dealt with to begin with. Another aspect of Friedman’s growing enlightenment to the “failure of nerve” was social science’s total inability to aid in the prediction of the success of people, institutions, and relationships – particularly psychology. On the contrary, these tools seemed to be a “force for denial.” While social science emphasized differences in cultural backgrounds, Friedman found through experience that there were commonalities across cultures that seemed to be much more useful in promoting positive change. Culture and understanding of cultures tend to act as camouflage to emotional processes. Formal authority has little to nothing to do with one’s willingness to stand up to problematic people. Sabotage is always part of the leader’s landscape and not native to contextual particularities. Leadership is predominately an emotional process, rather than cognitive and this book will help leaders combat the orientations listed above. When motivated, creative people in an organization are frustrated, ultimately one will find a “peace-monger” as a leader. Well-differentiated leaders, on the other hand, can persist with their own goals in the face of sabotage, swirling emotions, and toxic environments, challenging such destructive forces. No one does this easily and everyone can increase their capacity to do so. Human institutions and systems are like any natural organism. The “head” doesn’t necessarily need to be connected directly to any “part” in order to spread influence. Rather the head is part of the body and influences all of it. 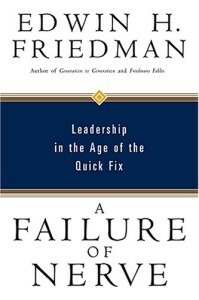 Friedman suggests that too much leadership training focuses on manipulating those who are being led. The focus should be on the leader. In family therapy, Friedman eventually sought out the best candidate for being the leader within the family and concentrated his work just on that person, sending the rest of the family home. Friedman did the same thing with organizations. Friedman worked on having those leaders become aware of their own emotional carry-overs from their families of origin, operating in the new system. These leaders must ignore the negative minutia and concentrate on giving their “I Have a Dream” speech. *This is the best internal summary of the book – start at the 4th paragraph; chapter by chapter summaries follow. Failure of Nerve is not a repetition of Generation to Generation or Friedman’s Fables, but an extension of those ideas. Chapter 1 – A metaphor showing how the outdated maps of Old World Europe fueled the stuckness of an entire civilization. A renaissance was needed then and now to make the sort of changes necessary to usher in a new world. Emotional resistances can act as “equators” blocking a sense of adventure that leads to progress. Chapter 2 – Modern America is as stuck as Old Europe despite technological and industrial advances in its state of emotional reactivity and anxiety. Five aspects of chronic anxiety are: reactivity, herding, blaming, quick-fix mentality, and lack of leadership. Each of these undermines the evolutionary process of adaptation to strength. Chapter 3 to 5 – Describe the limiting “equators” that are symptomatic of social regression. They are: 1) favoring data over decisiveness; believing the illusion that knowledge creates clarity, 2) an orientation towards empathy over responsibility – focusing on weakness rather than strength, and 3) a confusion with self and selfishness. Chapter 6 – Called the “keystone chapter” of the book by Friedman, it shows how the only real thing a leader needs to work on developing is his or her self-differentiation. Chapter 7 – Explores the basic unit of emotional relationality – the triangle and how understanding emotional triangles can assist with self-differentiation. Crises are a major part of a leader’s life – coming from the outside and sometimes, strategically initiated. Chapter 8 – Deals with the crises that are not of the leader’s own making through the power of presence. Friedman ends the introduction with a warning that the ideas of this book are subversive and he expects criticism. He insists that there is no political agenda, but acknowledges that his ideas will threaten certain political, religious, therapeutic and other perspectives. Individuation – The process of letting responsibility remain where it legitimately resides rather than taking it upon one’s self. Sabotage – The destructive emotional forces in a system that work against progress and leadership. It isn’t dependent on particular situations, but part of the landscape of leadership and organizations.